At the start, I want to make it very clear that I am not sharing this following story to vent my anger, “get one over on” my aggressors, whine, complain, or be petty. This event in my life taught me a lesson that no college class in the world could have bestowed. I actually couldn’t be more grateful for this small outbreak against me, because it lit an all-consuming fire within me to keep going not only in the face of discouragement, but because of the nature of the discouragement. By sharing this with you, I hope to encourage the same fire for Christ in at least one reader. If that happens, I’ve accomplished my goal. God can and will use anyone for His Kingdom work, as long as that person doesn’t allow darts (from the enemy or another person) to keep him or her from it. A couple of months ago at the time of this writing, I went on The Jim Bakker Show[i] to talk about my book, Radicals: Why Tomorrow Belongs to Post Denominational Christians Infused with Supernatural Power. I spoke on several topics, from the book of James’ “faith without works is dead” conundrum, to what “lukewarm” really meant to the Laodiceans in the book of Revelation, to what the Church as a whole needs to do to embrace the current movement of the radical Body that God is raising up all around us—and several other topics. My central message, however, was to embolden members of our current Body to rise up and take ownership of their role in the Great Commission with passion and love for all. This should be done regardless of how uncomfortable it makes people in the Body feel, which is the central message of Radicals. Toward the end of the interview, Brother Jim gave me the opportunity to give a final word to the audience members, who responded with a double standing ovation (one of which occurred off-camera). Several points of discussion led up to and fully explained my final words. However, about a week later, SkyWatch TV emailed me a YouTube video they had made involving only my final—and strongest—thoughts. They asked for my permission to present the video and, of course, I agreed. The video was posted the following day with the title, Does the Future of the Church belong to Radicals? The short piece opened with statements of support from me to women who feel called to teach and preach, spoken seriously and passionately as a wrap-up to all that I had said prior about the stagnant and apathetic developments I have witnessed in the Body of Christ. The crowd at that time was so loud that I found myself shouting just to be heard above the noise (as you can see in the short clip during the book’s trailer). The funny thing is, my words weren’t even that articulate. I wasn’t saying anything new, and I certainly wasn’t saying anything that just about anyone else in the Church couldn’t have said with equal zeal. Nothing about my words were particularly powerful or anything most members of the Church aren’t already aware of. In fact, the constant applause was a bit surprising to me, which is why I can be seen laughing during the standing ovation. (Well that, and the fact that I was joyful to see my words encouraging people out there.) Until this moment, I still have no idea why my words drew such an enormous reaction, but evidently the Church is so starving for encouragement that it only takes one voice to say the simplest thing. There I was, attempting to tell “that other voice out there” to stand up and live his or her ministerial potential to its fullest, and that “voice” in the moment was mine. It was unreal how that taping went down. For the first twenty-four hours or so after the video recap that SkyWatch TV put up, viewers were allowed to post comments. The comments were coming up so fast that more were appearing even as I read them, and many were replying to posts left by others. Every single comment was hateful and derogatory. Men of Israel, take care what you are about to do with these men. For before these days Theudas rose up, claiming to be somebody, and a number of men, about four hundred, joined him. He was killed, and all who followed him were dispersed and came to nothing. After him Judas the Galilean rose up in the days of the census and drew away some of the people after him. He too perished, and all who followed him were scattered. So in the present case I tell you, keep away from these men and let them alone, for if this plan or this undertaking is of man, it will fail; but if it is of God, you will not be able to overthrow them. You might even be found opposing God! These YouTube comments were a few of many, and all—every last one—came against me, not because of my message of encouragement, or even because my teaching was in error, but because I’m a woman. I happened to be born female, and therefore (as they say) God cannot use me in this specific platform. I am to “sit down, shut up, and repent.” To believe otherwise is to be an “apostasy woman.” Even more frustrating than this is that the rest of my message (the earlier portions of the taping that this particular audience hadn’t viewed) was important as context to this final stretch. When SkyWatch TV asked if they could only show this last portion, it never occurred to me how “usurping” or “women’s lib movement” it may have appeared. So, all this judgment was without full understanding to begin with. Many more crude things were said about me as the minutes flew by. Some of the names I was called are too profane to even repeat. (Suffice it to say that only by preaching, I have now been compared to a woman who sells her body for money in dark alleyways—this accusation given by so-called Christians.) But I will never forget what I read, not because it hurt me deeply, but because it showed me the level of scriptural ignorance that plagues the Body of Christ…and I am saddened by what people are really garnering from the holy texts of old. If they are that bothered by what you’re doing, they should find a medium to teach what they believe instead of trolling other members of the Body from their PC or smartphones at home. If the Holy Spirit is behind their work, He will bless it. But online badgering isn’t doing anything godly or productive. All it does is the opposite, and your Radicals book essentially states that over and over again. You’re simply a target of the very kind of attack you’re preaching against. What irony! The enemy would love nothing more than for you to “sit down, shut up, and repent” for being obedient to the Lord’s radical calling on your life. What you need to do is the opposite: Stand up, shout, and glorify God. You know that, don’t you? I mean, what did you expect? That the enemy would send you happy thoughts and that the “old suits” in the Church would stand behind you? No way, man! When God says “go,” you go. That’s in your book, too. What are you waiting for? I will admit that I have many times been challenged to check, recheck, and check again all the theology I am speaking about right now and have (as a Bible College student and licensed minister in the Assemblies of God) been taught by mostly male professors (and by the way, my new book The Handmaidens Conspiracy has dozens and dozens of scholarly footnotes from research papers starting with the earliest church fathers to modern academics in support of my thesis). Even then, each time someone throws a verse at me, I pray again for wisdom and reassurance. I know that the biblical interpretations included in Handmaidens will get me into hot water, and I’m already anticipating the darts. But I also know that true Christianity is frequently uncomfortable. The Bible is packed with proof that the followers of God were recurrently confronted by His own people. Christ, Himself, was heatedly opposed by the Church leaders of His day. I am not Christ, I am not a prophet, and I am no smarter or grander than any other within the Body. My message may not be more intelligently or articulately presented than others’. But this conundrum about women’s voices has to be addressed—and from my standpoint, nobody else is taking the reins. Are some really still—still—saying that women aren’t allowed to speak in the Church? Is that really, truly, honestly something some continue to teach? When I initially heard from the Lord that this book needed to be written, Defender Publishing’s release schedule had me booked for research work on several other titles, so the project was shelved until I was once again free to give it my complete focus. Then, last year, SkyWatch TV sent me to a women’s conference where the subject of women preachers was dealt with in depth. When I returned home for a debriefing meeting, I sat with CEO Tom Horn and told him that I thought the time was now for this message to reach the hundreds, thousands, and perhaps millions of women who are right at this moment allowing themselves to remain silent under the misconstrued traditions that often refuses to balance patriarchal and matriarchal hierarchies. Tom agreed, and the work began immediately. When the comments on YouTube flashed up on my screen, it was merely a confirmation. But before we discuss what academia, history, and Bible scholarship says, it will be important in the next entry to address the question of “culture” and its role in quelling the ministry of women that Joel prophesied, Jesus initiated, the Holy Spirit sanctioned (starting on the day of Pentecost in Acts 2), and the Apostles confirmed. FREE! 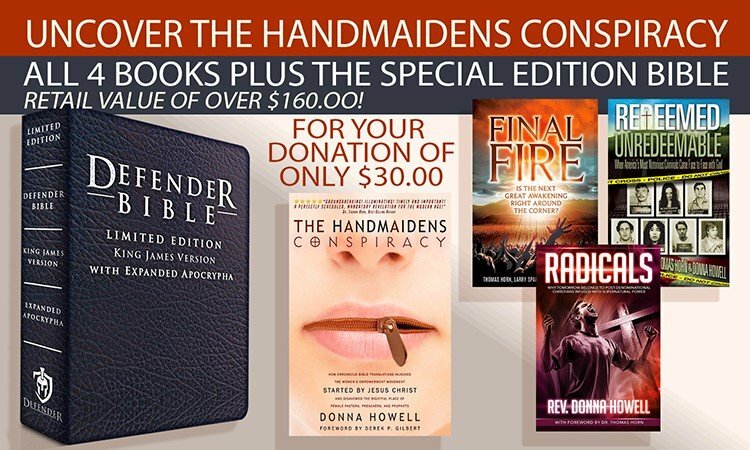 NEW LIMITED-EDITION COLLECTOR’S BIBLE WITH “EXPANDED APOCRYPHA” PLUS MORE FREE BOOKS!! [i] This interview is available at the following link: Donna Howell, The Jim Bakker Show, aired June 6, 2017, 19:58–26:51, https://www.jimbakkershow.com/video/angels-prophecies-day-2/.